I joined PBS NewsHour host William Brangham to talk teacher strikes. Teacher strikes and walkouts have been spreading from West Virginia to Arizona. Thousands of Kentucky educators rallied on Friday at their state Capitol, as Oklahoma’s largest teachers’ union called for an end to their nine-day walkout. 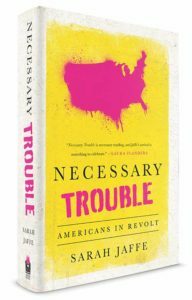 William Brangham talks with Sarah Jaffe, author of “Necessary Trouble,” about what these states have in common and why it’s happening.